North St Standard is an independent bar and kitchen on North St. It is the sister bar of The Urban Standard on Gloucester Rd. Menus vary from delicious burgers and wraps, to steaks, small plates and sharing platters. The Old Bookshop is a sumptuous port-of-call for the discerning ladies and gentlemen of Bristol. Enjoy an ever changing menu in an intimate environment wrapped up in rooms full of antiques and curiosities. 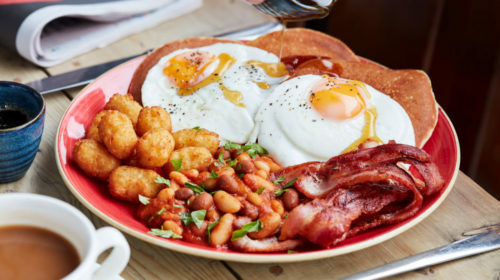 Serving tasty dishes from breakfast, lunch and dinner The Lounge is something of a Bristol institution. It first opened its doors in August 2002 and since then has become one of the mot popular cafe/restaurants in the entire city. With a strong emphasis on British cuisine The Spotted Cow’s menu changes on a daily basis, reflecting the seasonal ingredients available to the chefs. They recently built their own roof garden, so much of the produce that ends up on your plate has travelled just a few steps into the kitchen. This lively pub in the heart of South Bristol has some of the best grub around. 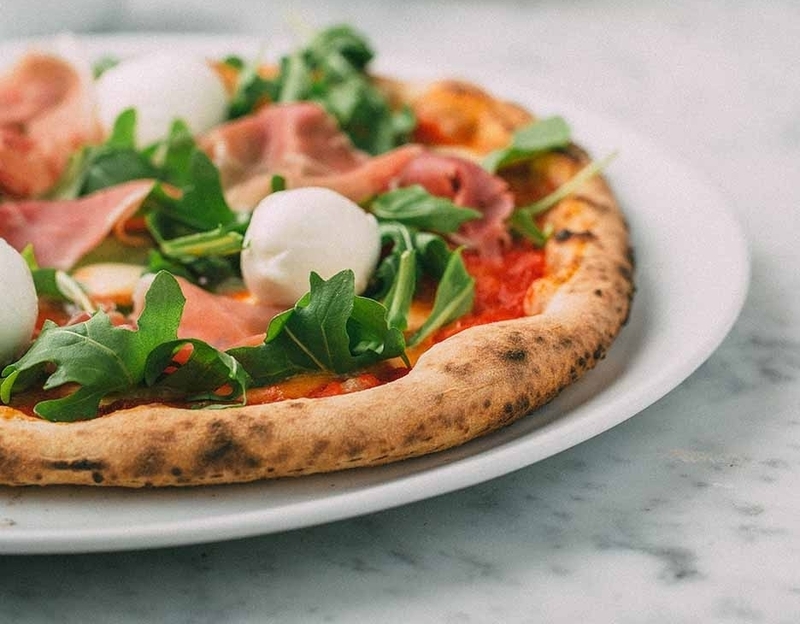 Their superb pizza menu combined with a Stateside grill menu of burgers, dogs, waffles and boozy shakes, means you’ll be spoiled for choice come dinner time. Whether you’re looking for afternoon tea, a quick bite or just a good old fashioned bacon roll then look no further! The place to be for afternoon tea! Margot May is an independent tea room serving tea, cakes, cream teas and plenty of it. Their extensive tea and coffee selection will leave you feeling spoiled choice, you’ll just have to come back over and over again to try them all. This Bedminster-based Christian charity/cafe was set up to bring positive improvement to the lives of the marginalised and wider populations of Bedminster and South Bristol. Providing work experience to the unemployed, assisting people in developing social and practical skills, providing free food for those who are homeless and in food poverty, the Refresh Cafe is one of the regions most vital. 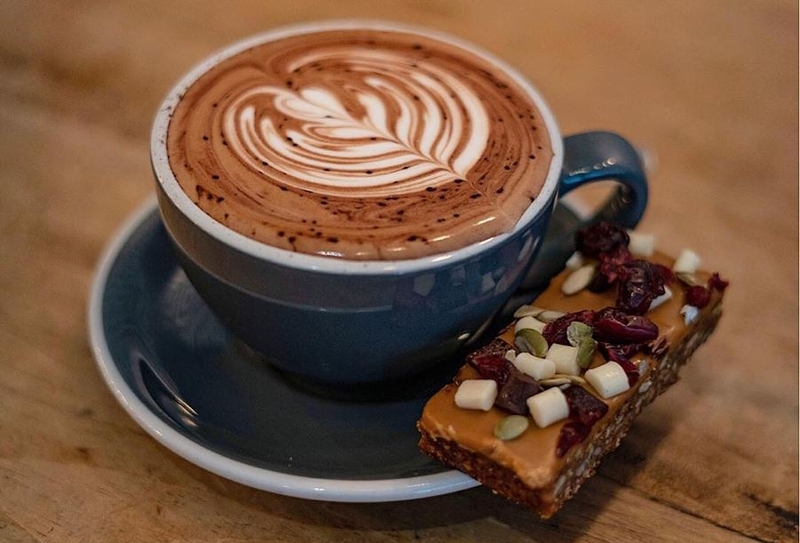 A local, independent cafe serving locally roasted speciality coffee alongside locally baked cakes and a small, seasonal menu with cocktails served until 10pm on Fridays and Saturdays. 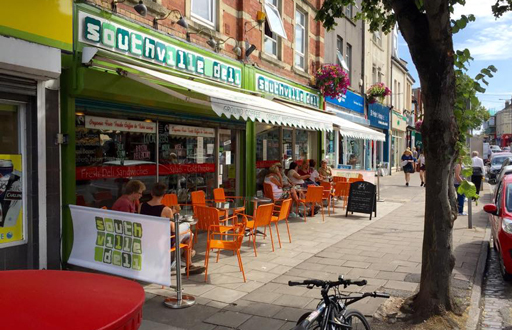 HERE IN BEDMINSTER YOU’LL FIND A DELICIOUS ARRAY OF BAKERIES AND BAKED GOODS… ENJOY! The story of Clark’s Pies starts a hundred years ago in Cardiff, where Mary Clark, the mother of nine children, worked as a housekeeper for a wealthy family. In 1929 Mary’s son Percy decided to branch out to Bristol, six years later he moved to new premises on North Street… the rest is History. Hobbs House Bakery was established in the Cotswolds in the 1920’s and they are a true family business with five generations of baking experience and are now bringing up the sixth generation of aspiring bakers! The Parson’s family have been making and baking for the people of the South West for over 100 years. Passed down through the generations, Parson’s sweets, savouries and breads are made fresh each day in their craft bakery. A slice of the UK’s largest bakery chain sits on East Street, Greggs serves up their signature steak bakes, sausage rolls, sandwiches and sweets to hundreds of hungry customers each day. An often asked question so we thought we'd answer this in style...you just need to choose from this delicious selection! One of the best known and best loved craft beer bars in Bristol, The Steam Crane has been with us since 2014. They have an incredible range of beers, an amazing kitchen and pretty unique history involving courthouses, hangings and even tigers. Sunday lunch is delivered on a huge white plate with lashings of gravy. A tough one to beat. The Old Bookshop is a sumptuous port-of-call for the discerning ladies and gentlemen of Bristol. Enjoy fine food and drink, an intimate musical experience and the artistic talents of our local community. All wrapped up in rooms full of antiques and curiosities. This is Sunday Lunch in a bustling and informal atmosphere delivered by the coolest bar staff in Bristol. 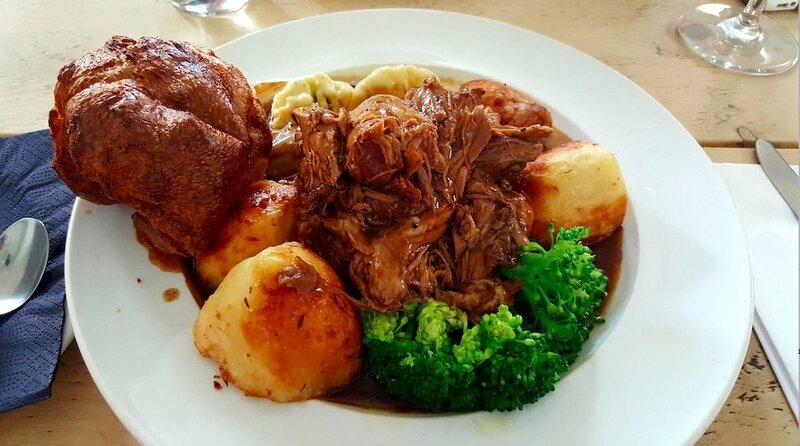 A vintage Sunday Lunch favourite in the area The Spotted Cow has been serving up stunning roasts for over a decade under its current management. Unbeatable roast chicken and seasonal veg, washed down with a mean bloody mary! Perfect if you like a late roast, The Ashville serves up Sunday Lunch from 12 to 7pm, with the meat options being topside of local beef, red wine braised leg of lamb, 12-hour slow-cooked pulled shoulder of pork, or nut roast. All are served with roast potatoes, a Yorkshire pudding, seasonal vegetables and gravy. A unique, friendly and welcoming neighborhood bar and restaurant with a focus on fresh, locally sourced and quality food. The Malago is run by brother and sister duo John and Helly and as you’d expect their spectacular roasts come with all the trimmings and be sure to ask about their weekly guest meat! Vegan Food is easy to find in bs3, a place where healthy eating has flourished in recent years. When this shrine to vegan food opened on East Street it raised a few eyebrows but now feels part of this traditional shopping street. An exciting new development for the area and a place where you don't have to ask if they have anything vegan on the menu because everything they sell is vegan-friendly. It's slogan is 'Vegan Junk Food' but there's nothing junky about the quality. Tucked away in the corner of the lovely Victoria Park is this little cabin serving all sorts of treats to dog walkers, families using the nearby play park and locals wanting a hot brew with a view. They know their customer base very well so always have plenty of vegan/vegetarian options. BS3's healthy hub is a must for anyone looking to eat well without compromising on taste. Wheat free, dairy free, gluten free and vegan-friendly food can be bought and eaten on their outside tables. A bit of cafe culture in the heart of Bristol. Popular for eating in or takeaway, the Italian management here pride themselves on crafting some of the best bases around to layer with their stunning toppings. A place for people who want their pizza thin, crunchy and tasty. Famous for its comedy nights but they also serve decent pizza too, with a whole menu dedicated to these circles of loveliness. Check out their midweek deals when you can get two pizzas for a generous discount. There’s no denying that Bristol loves coffee and here in Bemmy you can get some of the best brews around. Relatively recent addition to North Street but caffeine fans already wonder what they did before it came along. They do a decent trade in cakes, dessert pots and savoury snacks but the coffee is the king here, served by people who know what they are doing. Like Dr Who's TARDIS, this venue looks compact from the street but opens out into a very generous space once you walk in the door. Established Bristol chain whose founders are, by their own admission, a bit geeky about beans and brewing, which adds up to some quality drinks for the rest of us. Close to the North Street/Dean Lane roundabout you'll find the delights of Hennesy's, where the friendly staff know many of their customers by name and also know plenty about coffee. There are some lovely nooks and crannies towards the back where you can find peace and quiet. Their cakes deserve a mention too.